Jaken heavy gauge steel makes our economy service cart superior to most other bolt-together carts on the market. Trays are 3 3/8” deep. Top tray can be reversed to provide platform top. This includes two swivel (locking) and two rigid polypropylene casters. 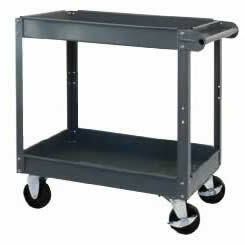 Economy service carts have durable gray powder coated finish. They are also easy to assemble. Jaken Co., Inc. has been manufacturing boltless shelving and other material handling products for over 17 years. Most recently Jaken has added a number of new products to our line of available products including FastRak Record Archive Shelving, FastRak Tire Storage Rack, FastRak Workbenches, All Steel Service Carts and All Steel Platform Trucks. Our products are unique for one reason; Value! Jaken Co., Inc. manufactures quality products that meet or exceed the more expensive manufacturer's standards at a significantly lower cost. In addition to our unbeatable value on quality products, Jaken offers outstanding customer service. Our knowledgeable staff is trained to provide prompt and courteous customer service and support. Whether placing an order, asking a technical question or requesting a quotation, we are here to help. We are confident that our winning combination of Value, Quality and Service will provide you with an excellent opportunity to save money and increase your sales. We are working hard to become the "one stop" source for all your warehouse and racking needs.